Having current and credible client testimonials serves many purposes. Recommendations are essential to build trust and social proof. Having them on your LinkedIn profile, social media and websites is crucial and will help your overall SEO and Google search. But the key benefit is that it provides the social proof that highly competitive sectors demand. Whether you are building sales, networks, finding high staff or suppliers how others have experienced you forms a core part of your personal brand and business market trust. But not enough small businesses and consultants ask and give them. As recommendations are highly visible on LinkedIn the level of trust and social proof it builds is powerful. People will not put their name on a public recommendation unless they are willing to have it stand up to verification and scrutiny. Anonymous or first name and initials are worthless on websites or social media- so don’t bother. A full name and ability to follow-up is crucial. The mosaic of your brand and business is multi dimensional. People are keen to read the experiences from clients as much as from suppliers (very important ) and current staff. Its valuable to gain insight on how people treat different relationships to minimise risk in future engagement. And a little understood benefit of having great recommendations is during the growth and hiring process. Top candidates will want to check you out also so testimonials helps build your business as a employer brand of choice. Be humble and appreciative. remember that most people will find it difficult to write a recommendation so often whilst happy to do so, find it a chore. 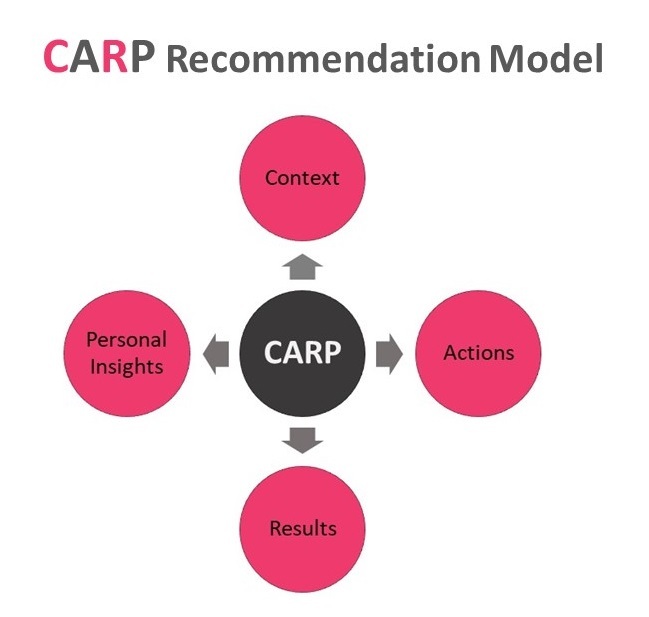 So you can provide them with the CARP Model below to writing recommendations or offer to jot down a few points to help them. And as like all communications and messages on LinkedIn – you should personalise your Recommendation Requests. NEVER use the default “ I’m sending this to ask you for a brief recommendation of my work that I can include in my LinkedIn profile. If you have any questions, let me know. Thanks in advance for helping me out. But a little caution. Some people are totally risk averse to put their name to anyone online. For whatever reasonn they don’t like to do so but will happily give a verbal one. Its rare but does happen so it’s a good idea to allow them to save face. PERSONAL INSIGHTS – share something of the person, and how you experienced them – authentically. Minimise cliches, robotic jargon, corporate speak and banal comments. Be generous with others also – where deserved of course. Recommendations can cover many experiences as mentioned – from a client, colleague, volunteer, staff, partnership or collaboration perspective. And a side benefit of giving and receiving is that there is multiplying impact of brand visibility for both parties. And widen the field in giving and receiving them. They may be from suppliers, staff, colleagues, volunteering, board roles or anyone that has had a really key experience with you and your brand. But be aligned at all times to your greater purpose and focus.